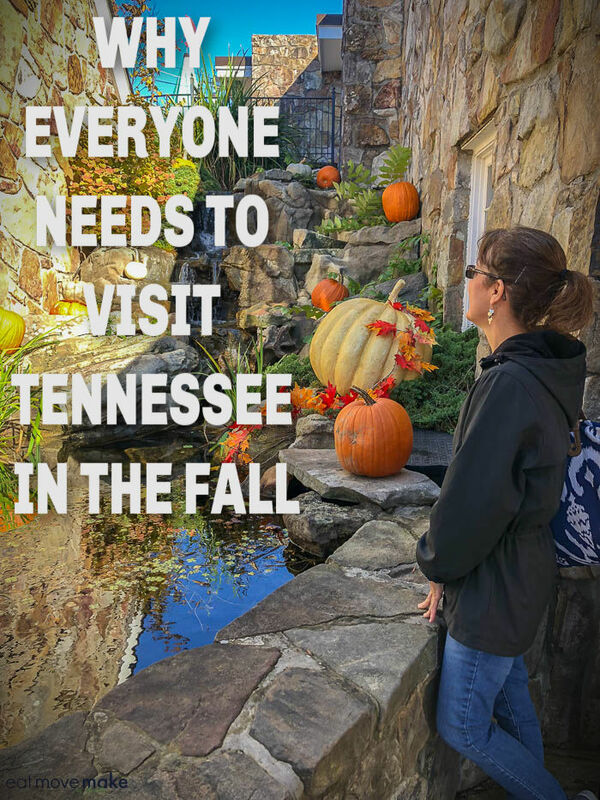 Thank you Tennessee Tourism for sponsoring this post. 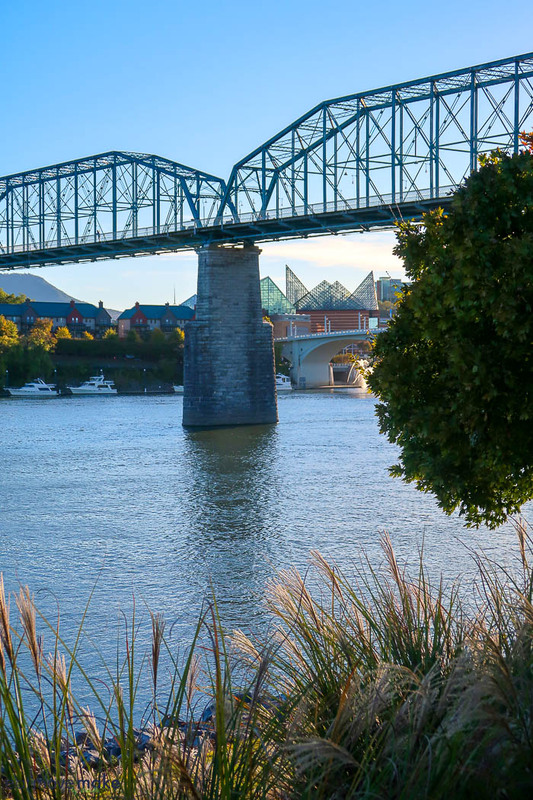 Plan your vacation to Tennessee, and experience the beauty with more to see! Fall is my favorite season in large part because of the changing leaf colors, and it always makes me sad when I’m oohing and aahing about it and my boyfriend doesn’t share my enthusiasm. All he sees is a blanket of brown. He has red/green color blindness which means red and green look exactly the same to him — brown. If it weren’t for placement on traffic lights, he wouldn’t be able to discern “go” from “stop”, and as far as enjoying nature’s spectrum of colors the way I do… well, he just doesn’t. But this year was a game changer. 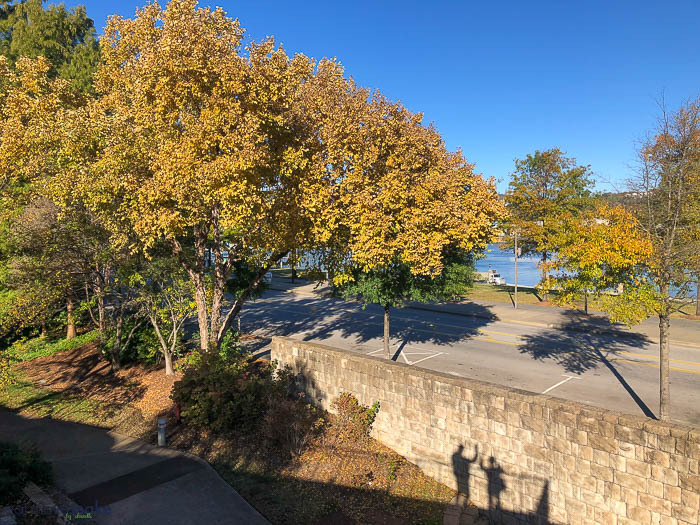 With sunshine in the forecast and beautiful fall foliage coming into its prime, my boyfriend and I set off to Chattanooga, Tennessee for the weekend to see those blazing fall colors in all their glory. Why Tennessee? 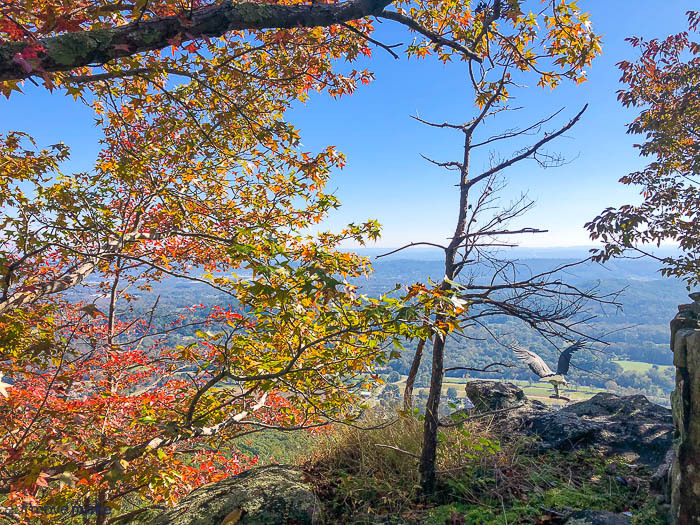 Well, firstly, Tennessee has some of the best fall views and everyone should experience them. 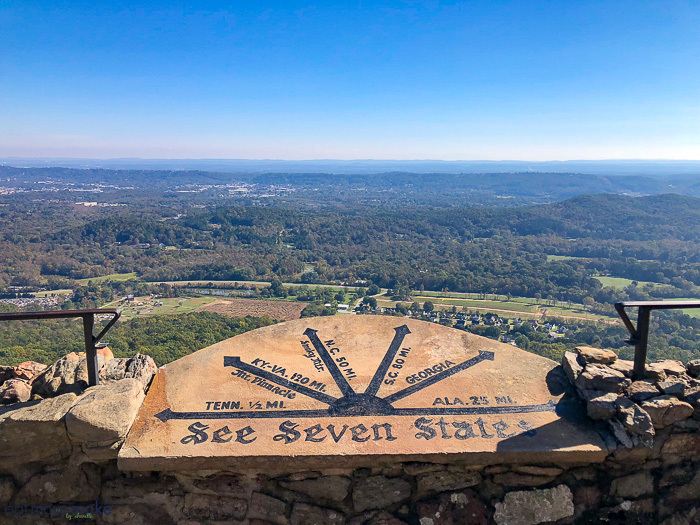 But secondly, my boyfriend is colorblind and Tennessee has special viewfinders that allow colorblind people to see the magnificent vistas the way most people see them. 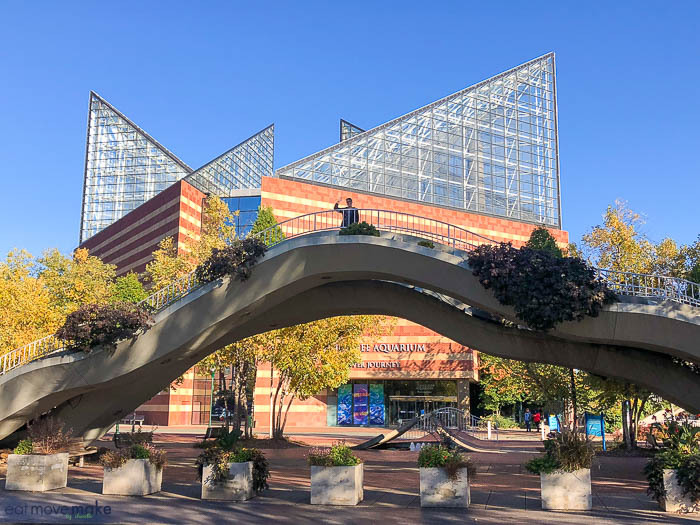 So off to Chattanooga, Tennessee we went! 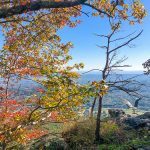 After a good night’s rest, we got up early and headed to Lookout Mountain State Park. 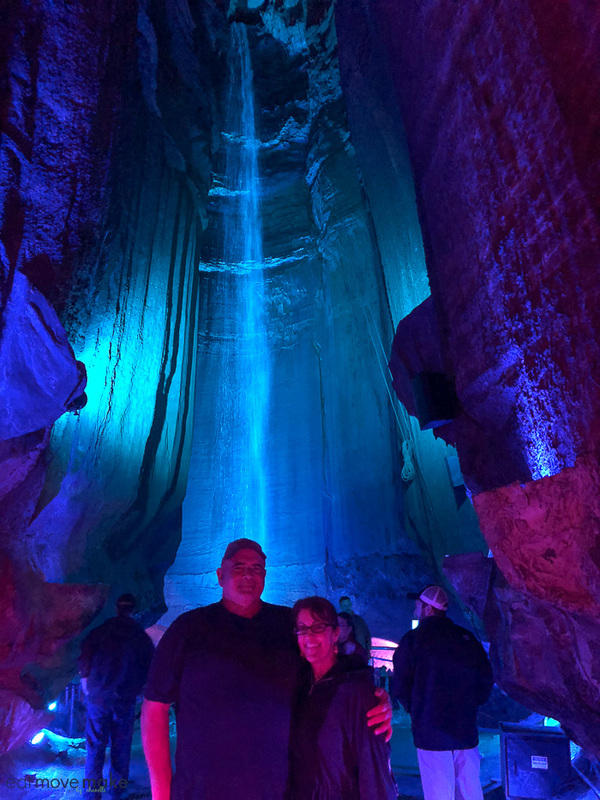 Because the morning fog hadn’t fully lifted, we decided to take the cave tour to Ruby Falls first. 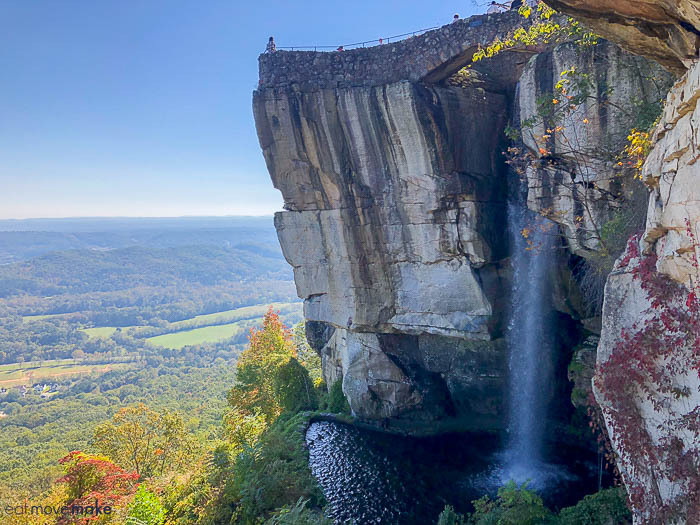 Yep, it’s an underground waterfall, and it’s one of those iconic Tennessee locations everyone should see at least once (especially if your parents never let you stop there as a child and you’re still bitter). 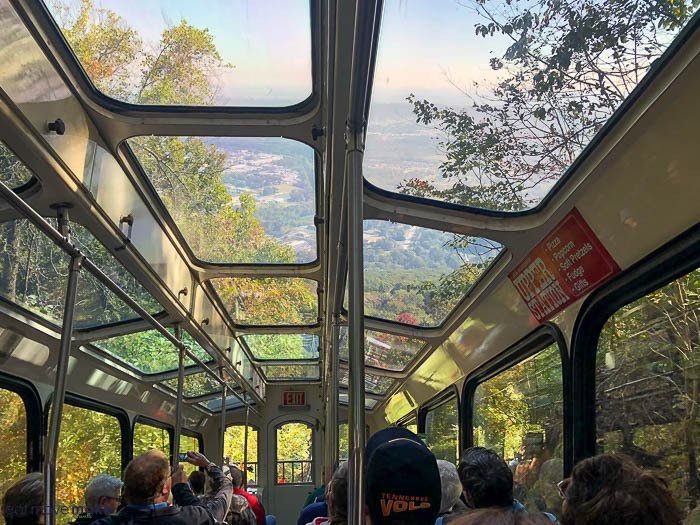 After our waterfall tour, we decided to ride the Lookout Mountain Incline, the world’s steepest incline! It took about six minutes to go from top to bottom, and then we rode it right back up again. The narration during the ride was fabulous and the views were extraordinary! 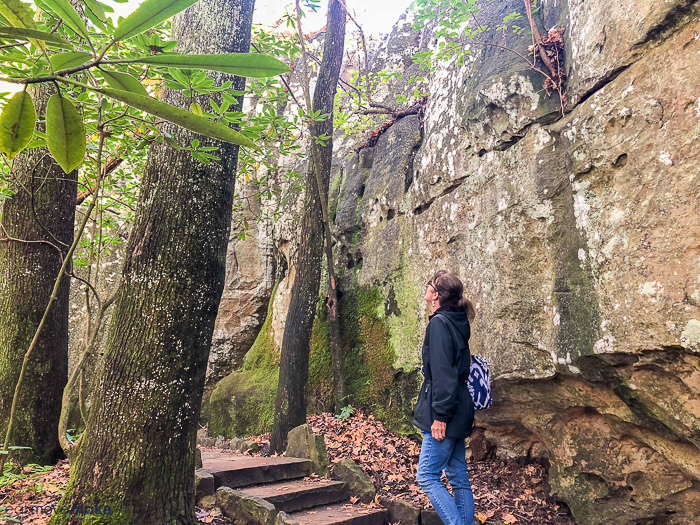 Next, we went to Rock City (also inside Lookout Mountain State Park) and yet another place our parents never let us go as kids. 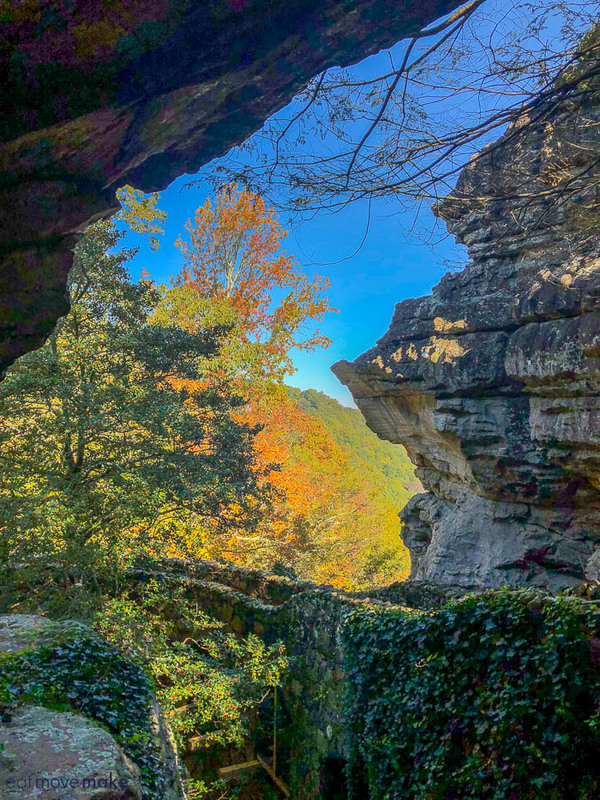 Visitors follow pathways and cross a swing-a-long bridge through ancient and unusual rock formations and lush gardens before finally reaching the famous “See Seven States” vista, a 100-foot waterfall and the most amazing views of the spectacular Tennessee fall rainbow. 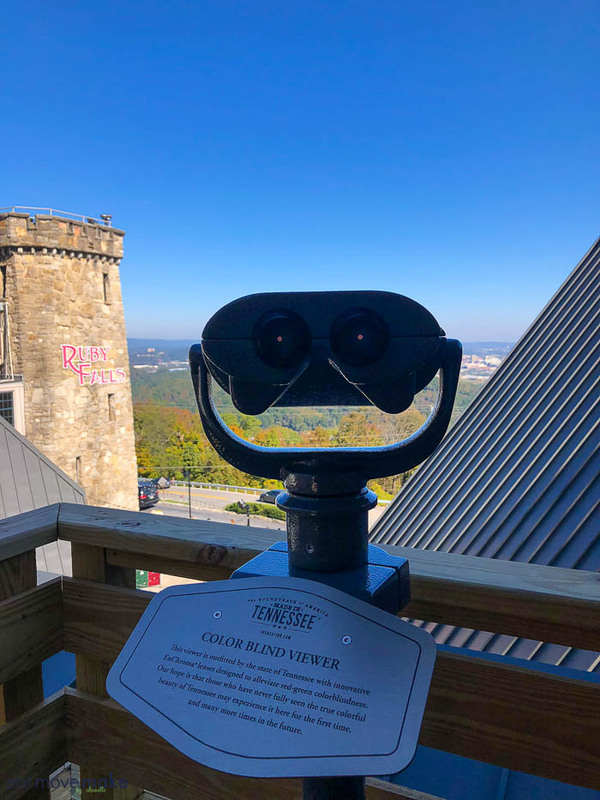 With the fog fully lifted, we headed back to the observation tower at Ruby Falls, the location of the special colorblind viewer, for a moment my boyfriend and I will never, ever forget! 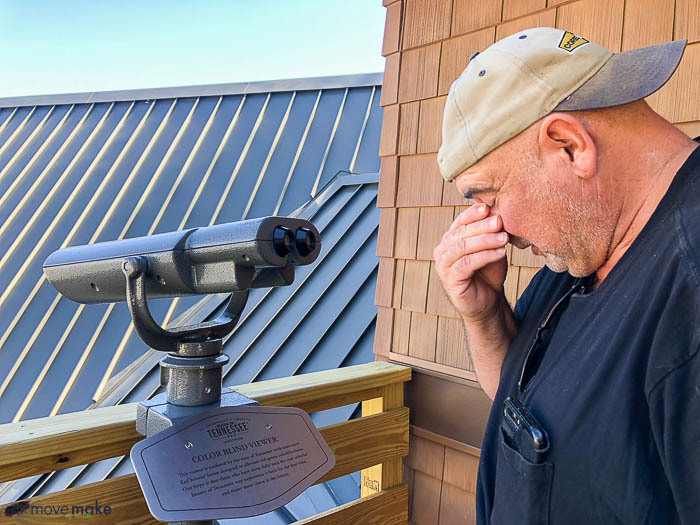 When you exit the stairway to the observation tower, the colorblind viewer is the first viewfinder you see. I was practically tingling with excitement when he took his first look. I had to fight back tears when I saw how overcome with emotion he was. 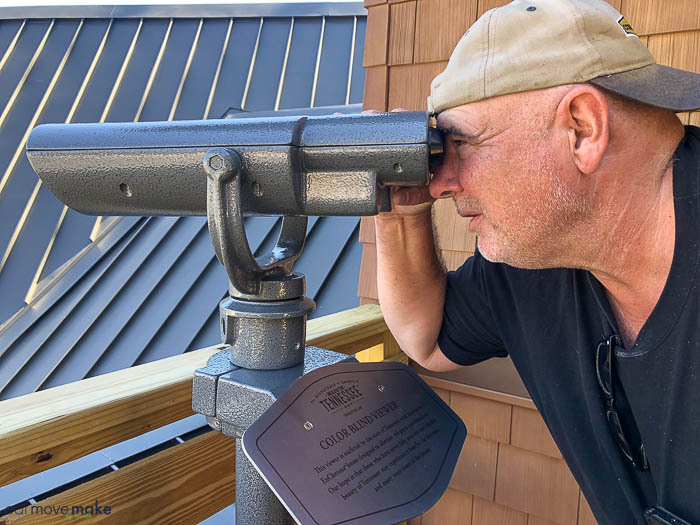 I hadn’t expected that, but he was blown away by the vivid and distinctly different colors he had never been able to see before. Y’all have to visit one of the colorblind-less viewfinder locations and see the wondrous colors of nature for yourself. I’m not sure anything will ever top that experience for my boyfriend, but our entire weekend in Chattanooga, Tennessee was phenomenal. 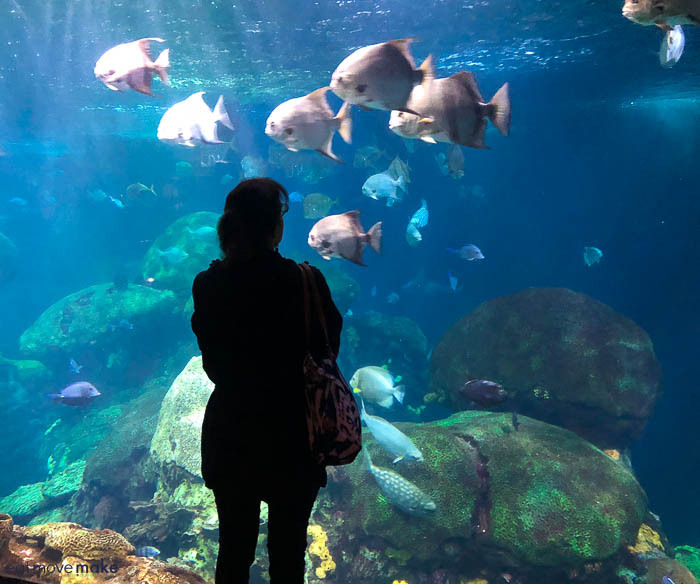 We got up close and personal with our aquatic friends at the amazing Tennessee Aquarium. 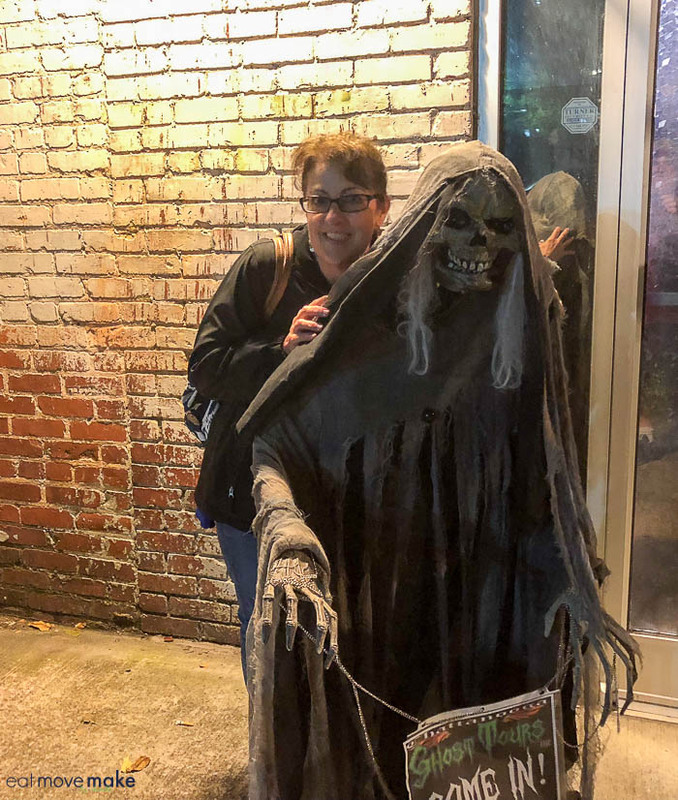 We took a Chattanooga ghost tour. 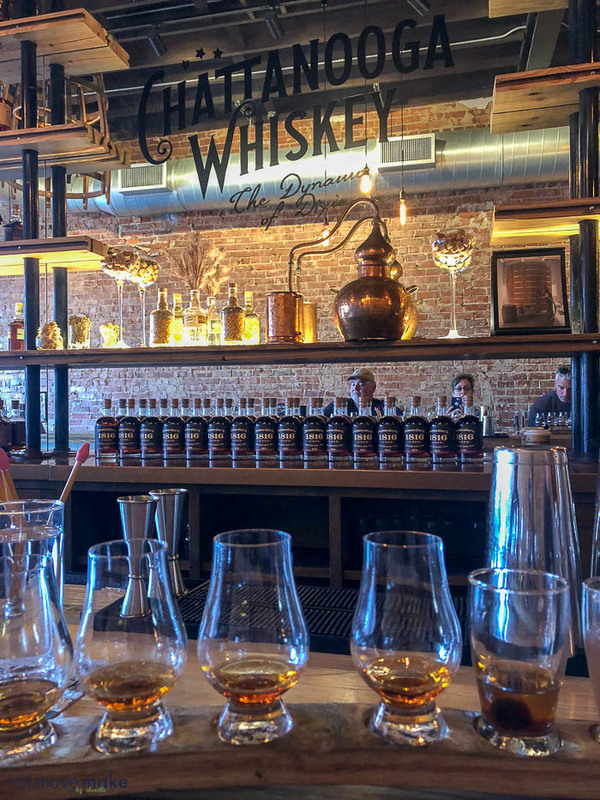 We sampled the original ‘1816’ whiskey that put Chattanooga Whiskey on the map, and we tried their experimental varieties too. 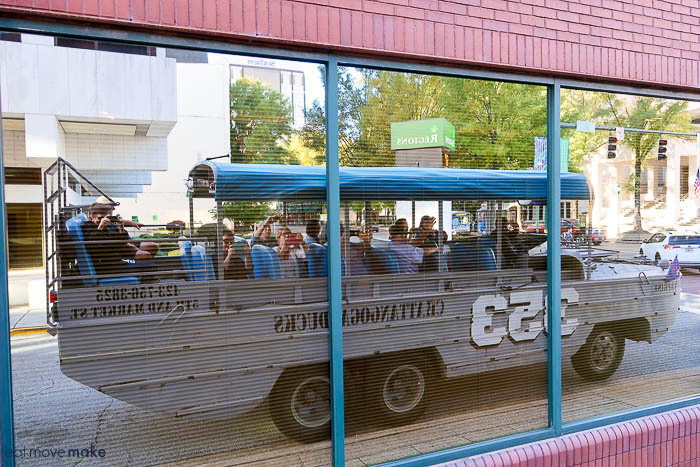 We took an amphibious vehicle ride on the world-famous Chattanooga Ducks. 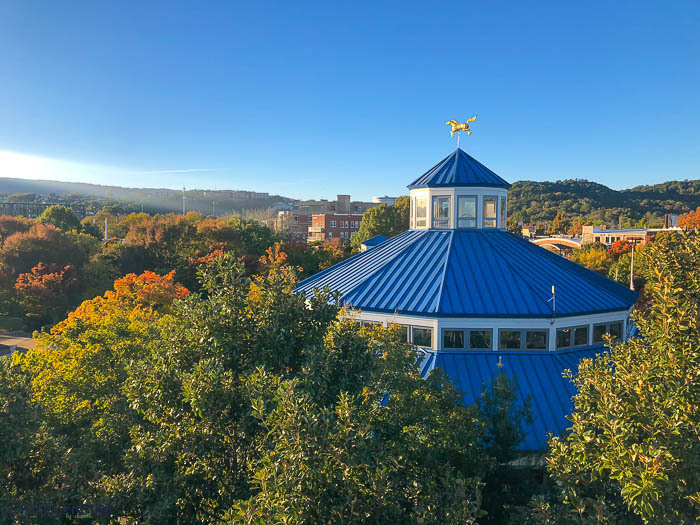 We walked the mile-long Walnut Street pedestrian bridge with stunning views of Chattanooga and the Tennessee River and strolled through Coolidge Park to see the carousel. 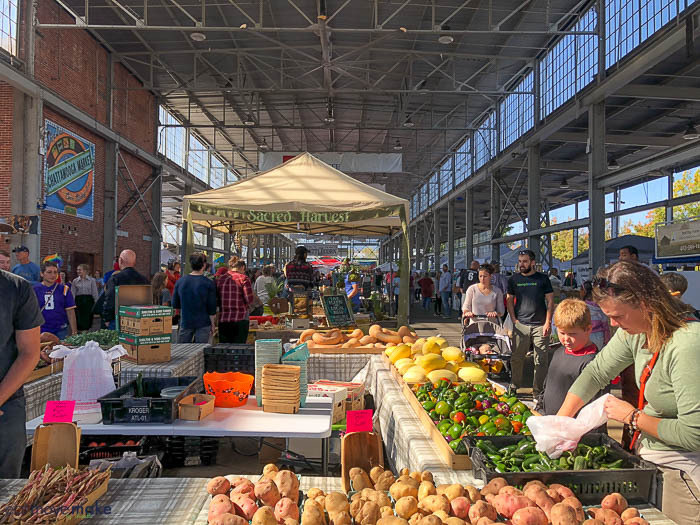 We shopped and tasted our way through the Chattanooga Market. And we ate some of the most incredible food we’ve had in a long time. It was truly a weekend full of fabulous memories, and Tennessee will forever hold a special place in my heart for giving my boyfriend the view of a lifetime. Plan a trip to Tennessee! It’s everything you could want and more. Decor items for this post were provided by Nearly Natural. You might already know that I’m a huge fan of Halloween and everything that comes with it. I love decorating for it, coming up with costume ideas, getting spooked at haunted houses, watching horror movies, making Halloween playlists, throwing parties—I love it all! But for as much as I love Halloween, I feel like I’m neglecting one of the main reasons I love it so much: the fact that it’s part of fall. Fall is without a doubt my favorite season. With the cool weather sweeping in, it always feels like a fresh start and reminds me of starting a brand new school year at college. (Go Bucks!) 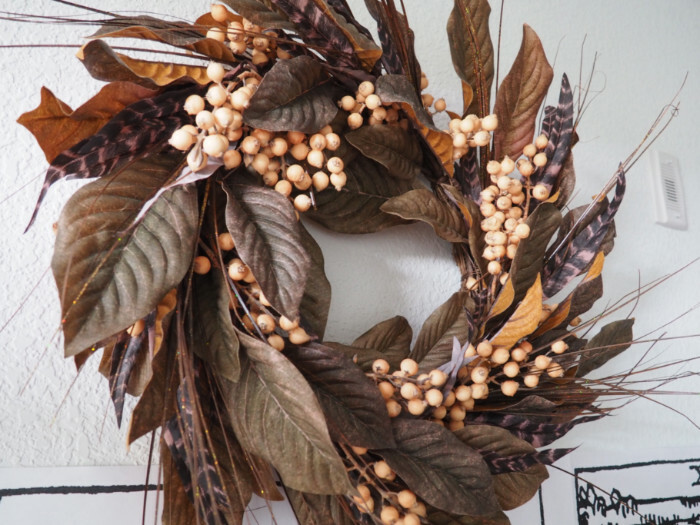 So this year I thought I’d give fall the welcome it deserves by decking out my house in Nearly Natural fall decor items! I’m not very good at keeping real plants and flowers alive. Even if I manage to keep them alive for any length of time, my cat takes care of them, if you know what I mean. 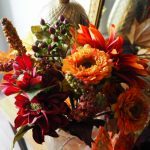 Nearly Natural silk arrangements are a great alternative to live plants because they always look great, can’t die, and can be reused year after year! When my Nearly Natural order arrived, the first area I decorated was my tv stand. As much as I hate to admit it, this area is the focal point of my living room, so it’s a natural place to add some seasonal cheer. 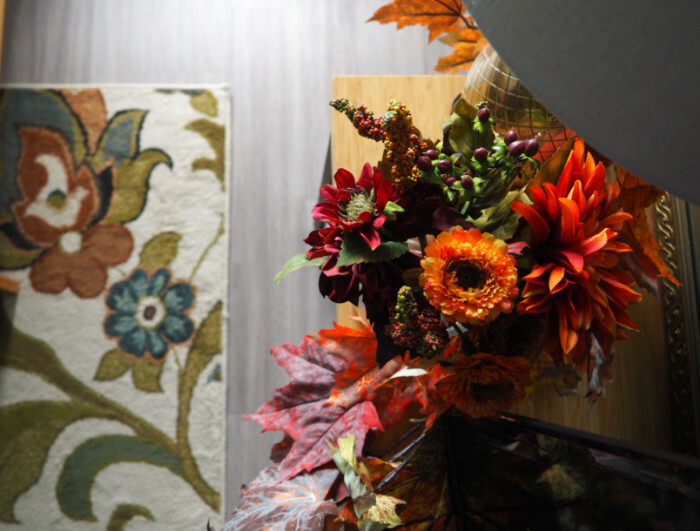 I placed the Dahlia & Mum with Vase arrangement next to my vintage pineapple lamp, draped the Maple Leaf Garland along the bottom of the tv, and hung the Feather and Berry Wreath up above. 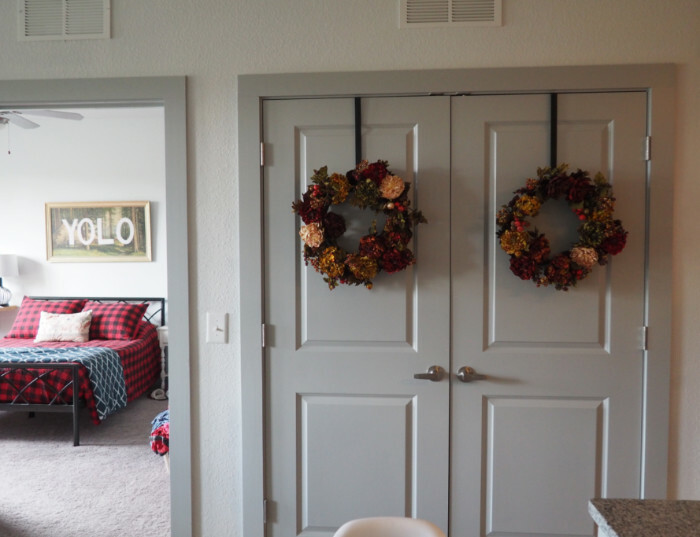 Next, I decided to hang two matching Autumn Hydrangea Peony wreaths on my laundry closet doors. I love how they look with my buffalo check bedspread in the background! Above my bed is my upcycled YOLO art—click here for instructions! 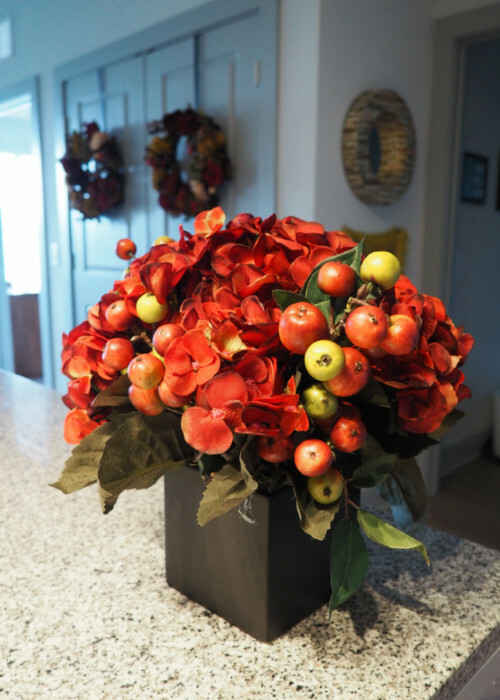 To bring the fall colors through the entire apartment, I placed the Hydrangea Artificial Arrangement in Black Vase on the corner of my kitchen island. I see it right when I walk in the front door and since my apartment has an open concept kitchen and living room, it helps carry the eye around the whole place. 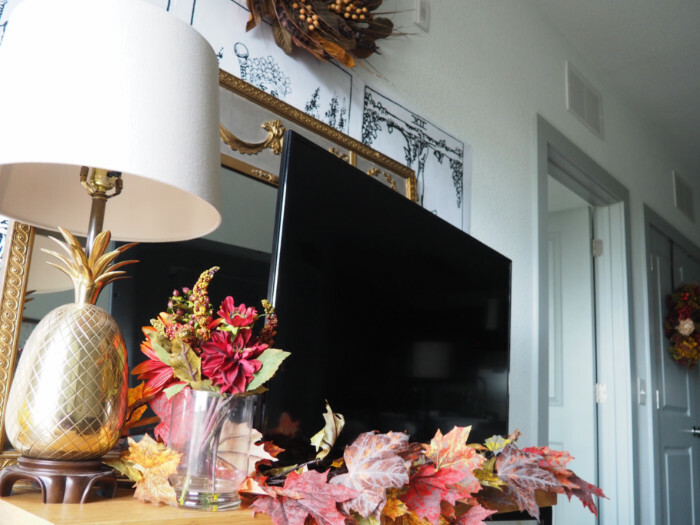 I could not be more pleased about how my fall decorating turned out and can confidently say that if you’re on the hunt for beautiful, high quality fall decor, I highly recommend Nearly Natural. Shop their entire fall collection here and use Nearly Natural coupon code FallCS for 20% off your order! You might have already read about how I prepared myself for fall: I switched over my closet for fall and started implementing some good mental health habits in anticipation of winter’s gray days. 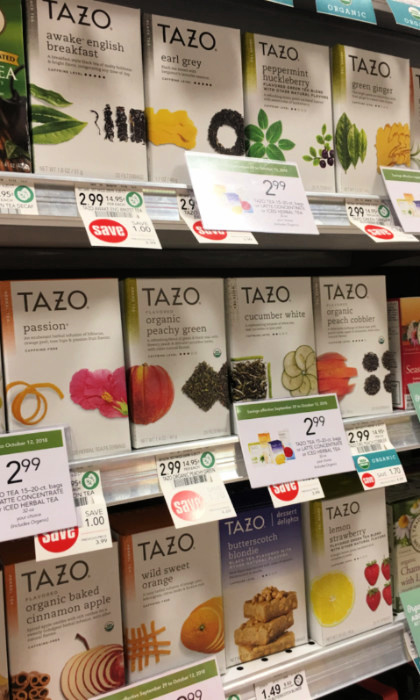 The other day I took a little shopping trip to Publix (thanks to Tazo Tea!) 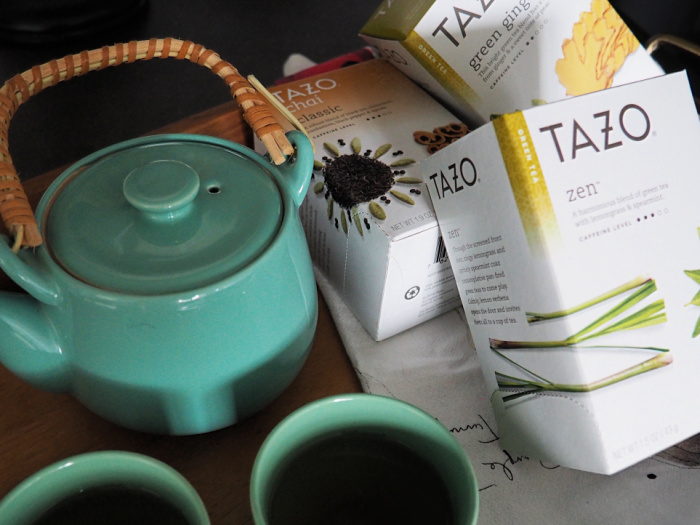 and stocked up on chai in all its forms—Tazo Chai Black Tea Concentrate and Chai Classic Black Tea bags…and maybe like four other kinds of Tazo Tea too. Now ya girl is fully ready for blanket & tea weather. invigorating any time of day. 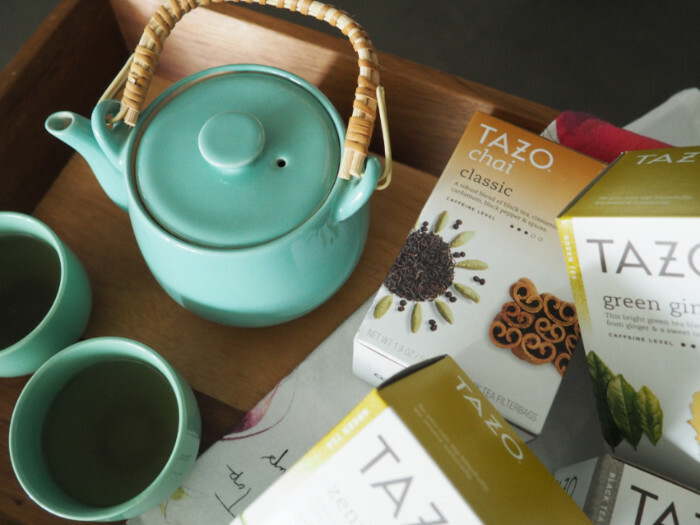 Green Ginger: This bright green tea blend has a kick from ginger & a sweet note of pear. My personal favorite is the Zen Green Tea. It has a gentle kick of caffeine from the green tea and a refreshing tingle from the lemongrass and spearmint. I find it really pleasant to start my day with a cup. 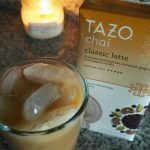 If you haven’t had Tazo Chai before, I like to think of it as Christmas in a cup. It’s a robust blend of black tea, cinnamon, cardamom, black pepper and spices that is warming and comforting to drink. You can get it in tea bag form to drink black or with a little sweetener and milk, or you can grab the Chai Black Tea Concentrate in a carton for a shortcut. 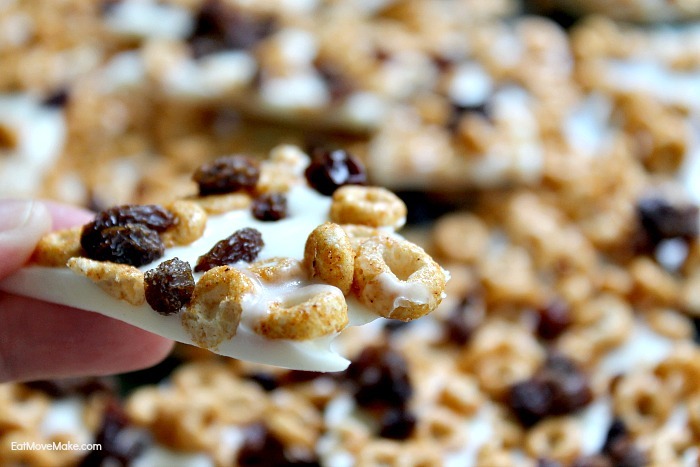 It’s pre-sweetened and ready to go! 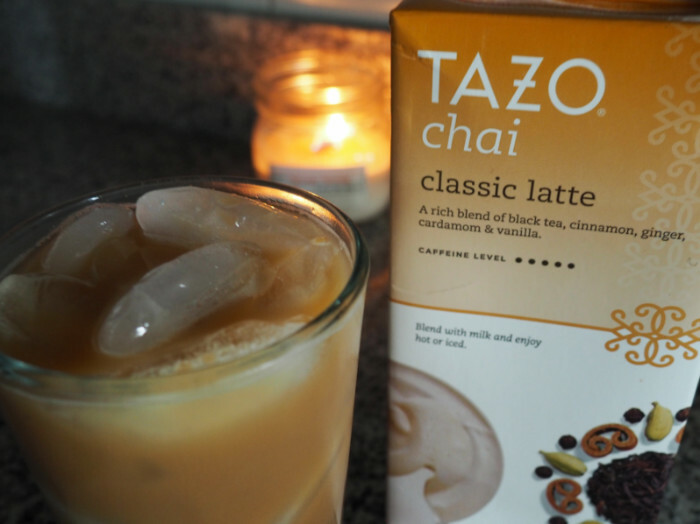 For a real kick, try our recipe for a Dirty Chai Latte below! It’s a chai latte with an extra boost thanks to a shot of espresso. Add 3 oz. 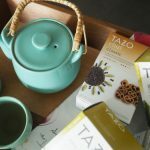 Tazo Chai Black Tea Concentrate and 3 oz. milk of your choice to a glass. Add a shot of espresso and stir. Top off with plenty of ice cubes and enjoy! 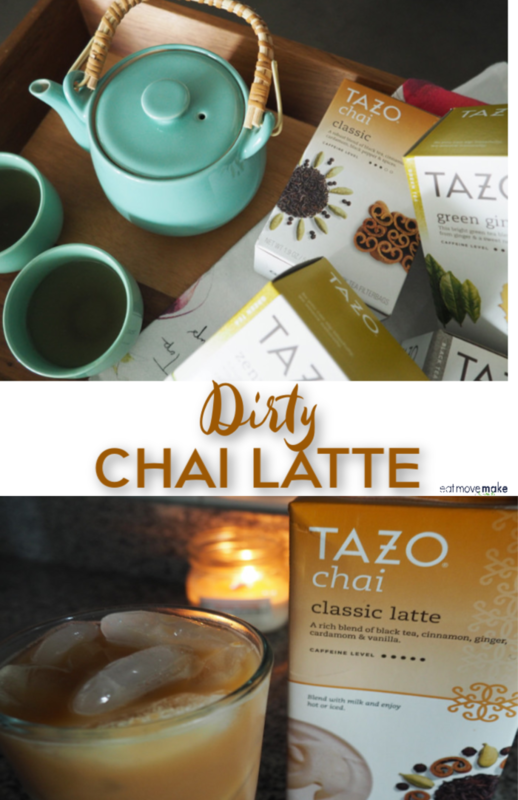 Pin the dirty chai latte recipe! 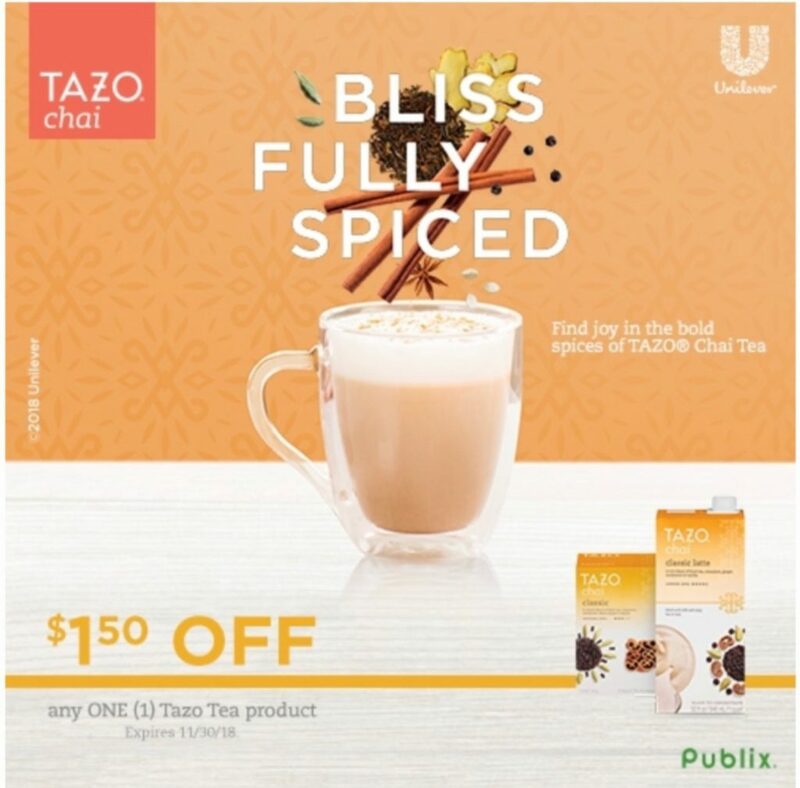 Check out the Publix weekly ad for this coupon: $1.00 off any Two (2) Tazo Tea 15-20 ct. bags or Latte Concentrate or Iced Herbal Tea 32 oz (includes organic). Valid 9/29 through 10/12. Complimentary product was provided to me by prAna to facilitate this post. Thanks prAna! 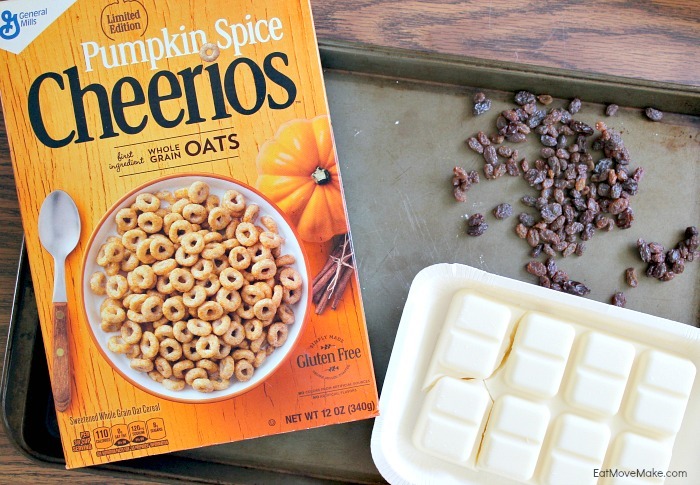 I know I should be sad about summer ending, but I’m not—I’m ready for fall! I’m looking forward to packing my shorts away and wearing all my favorite jeans, sweaters, hoodies, and boots. I’ll be enjoying the transition between seasons with some looks that combine summer staples and fall favorites—check out my comfy look below—as well as making changes to my routine to prevent seasonal affective disorder from kicking my booty this year. Here I’m wearing the prAna Oberlie hoodie with the Transform high waist capri, but I paired the outfit with my favorite sandals for more of a transitional vibe. I ordered my Oberlie hoodie two sizes up for the perfect slouchiness! The Oberlie hoodie is extremely soft, made from blend of organic cotton, nylon, and wool, and the Transform capris are bluesign® approved, meaning that they’re produced and dyed without contaminating the environment with harmful chemicals. 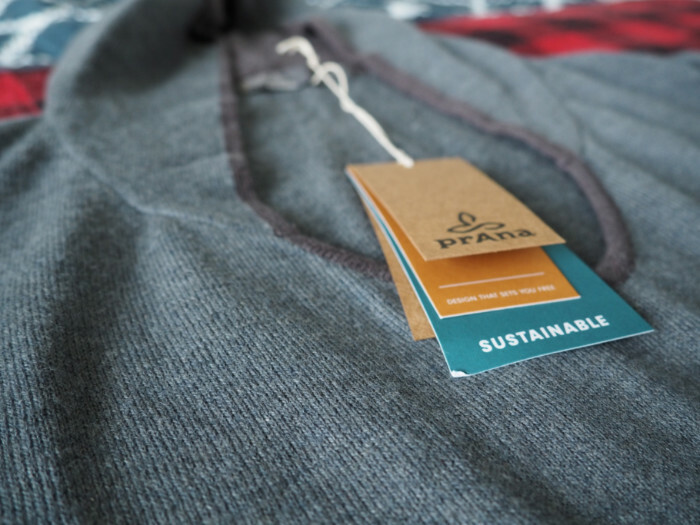 Shopping with prAna is guilt-free because of their commitment to using sustainable and recycled materials! 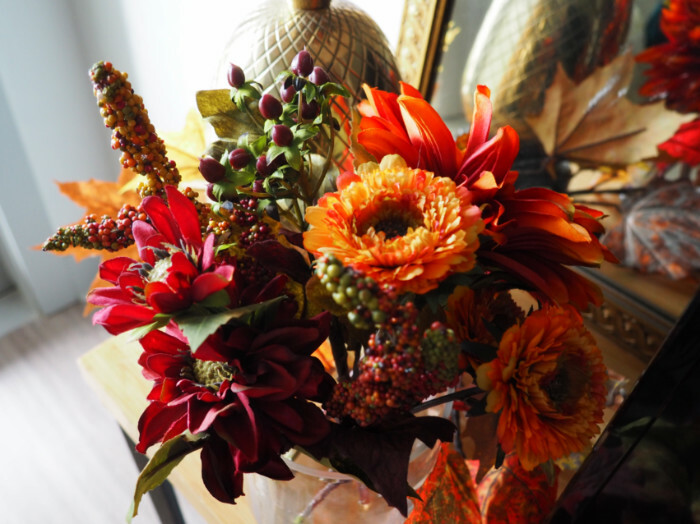 While I’m preparing my closet for fall, I’m working on preparing my mind for fall as well. As much as I love the cool weather, seasonal affective disorder caused by darker mornings and shorter days can make it challenging for me to maintain good mental health. I find I waste less time watching YouTube and get better sleep when I charge my phone in another room overnight. Scrolling on the phone is a hard habit to break, but your sleep schedule will thank you for it. I used an app called Pacifica to track my habits for several months last year and noticed that I had the best mental health days when I’d gotten plenty of sleep the night before. Time to recommit to getting 8 hours of sleep each night! Since my phone will be charging in another room, I hope to roll out my yoga mat when I wake up instead of rolling over to grab my phone and check Instagram. I thought light therapy was a bunch of woowoo until I actually tried it. I’ll be incorporating it back into my morning routine post-haste! All it takes is 30 minutes soon after waking up for a nice energy boost. 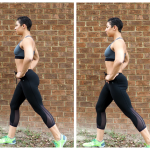 I’ve become bored with my workouts over the last year or so, so I’ve been changing things up to make fitness more fun. I subscribed to a workout app that plans my workouts for me and joined a challenging functional fitness group class! ‘Nough said. Doesn’t everyone feel better when they eat more veggies? I ordered my Oberlie hoodie two sizes up for a slouchy look. Are you and your closet ready for fall? 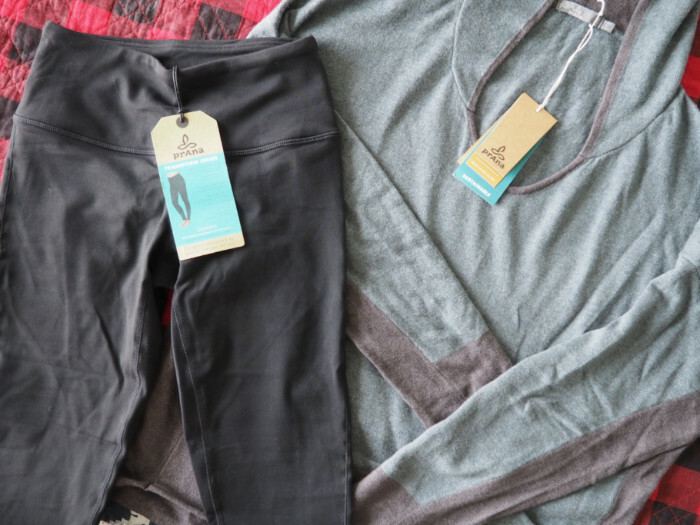 If you still need to stock up on comfy and sustainable clothes for fall, use code ESLMF18 when you shop prAna online for 15% off your purchase! 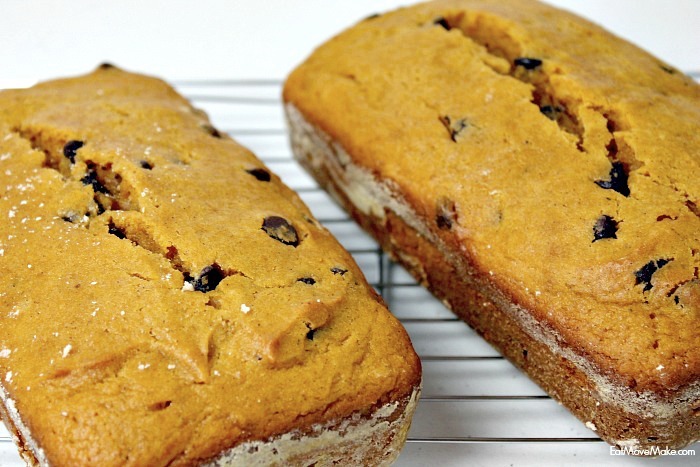 You know a chocolate chip pumpkin bread recipe is good when it bakes two loaves and they’re both gone within a week. That may not seem that fast to those of you with large families, but there are only two people living here. It was fast! 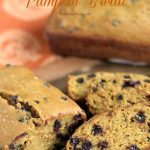 I usually give pumpkin the solo spotlight, but when I was gathering spices from my pantry for the recipe, I caught sight of a bag of chocolate chips. Oooooo! 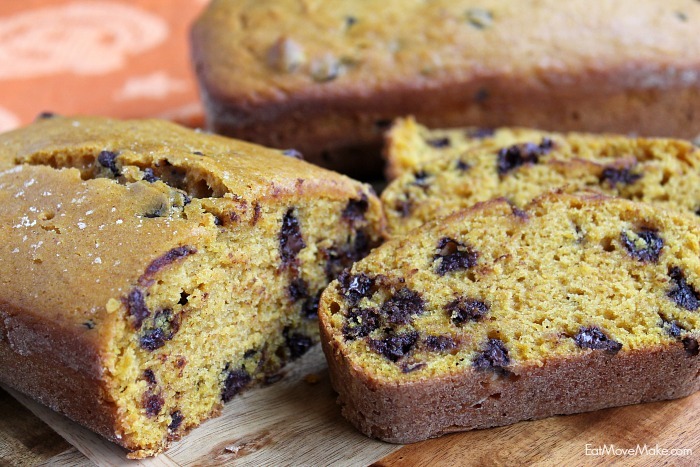 The only problem was that I had no idea if chocolate and pumpkin went together. So I decided to make one loaf with the chocolate chips and one without, but then I threw caution to the chocolate winds and added chips to everything! Yolo. Or somethin’. Thank goodness it worked — delicious! Combine flour, cinnamon, nutmeg, baking powder and salt in mixing bowl. Add eggs, sugar, pumpkin and oil. Mix until well blended. Stir in chocolate chips. Cool for 5-10 minutes; remove from pans and cool completely on wire rack before slicing. 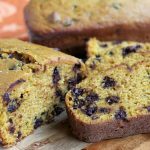 The best thing about about this chocolate chip pumpkin bread recipe is that it freezes and reheats well. Once the loaves are completely cooled, I cut them into slices, place in loaf form inside a freezer bag and freeze. To reheat, grab a slice from the freezer, place it on a paper towel or plate and microwave for about 20 seconds. 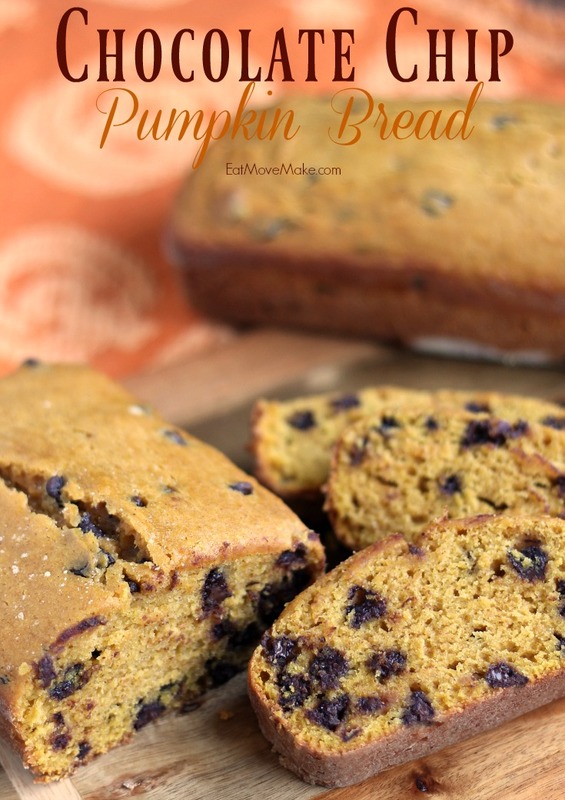 The chocolate chips get all melty in the warm bread, and it tastes absolutely scrumptious! 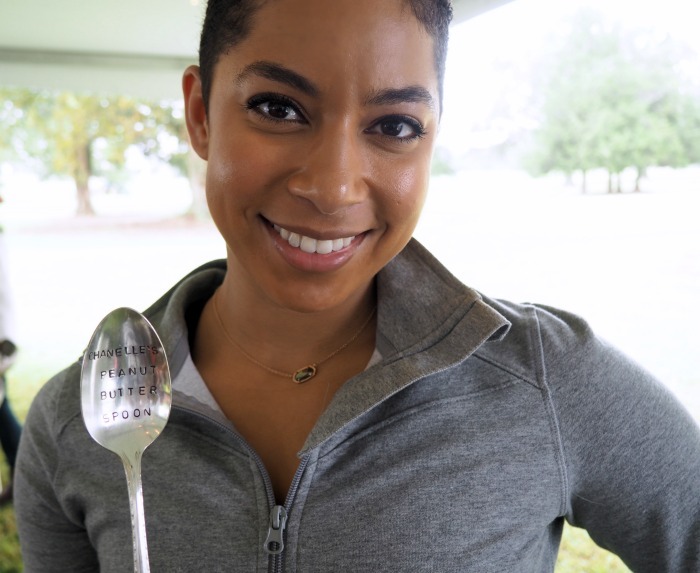 Check out my other pumpkin recipes too, including my extremely popular Pumpkin Pie with Brown Sugar Oatmeal Cookie Crust! Thanks to Danskin Now and Iconix for sponsoring this post! All opinions my own. For me the fall always seems to come with tons of life changes, too. 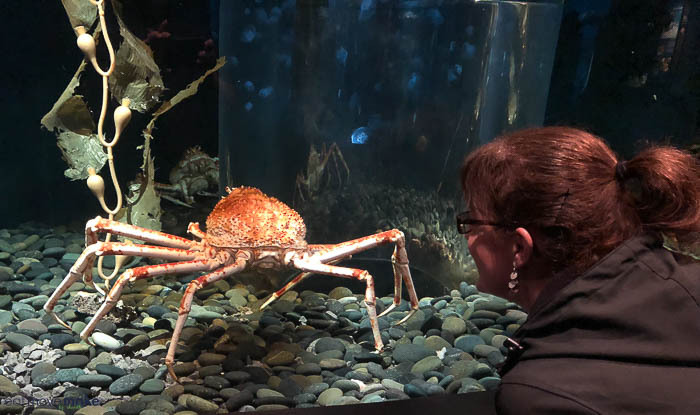 Last year I was adjusting to living in a new state after moving from Ohio to North Carolina to work on this very blog with my mom. This year, I’m moving to a bigger city after spending about a year and a half here and finding (well, more like confirming) that this town isn’t for the like of a city mouse like me. 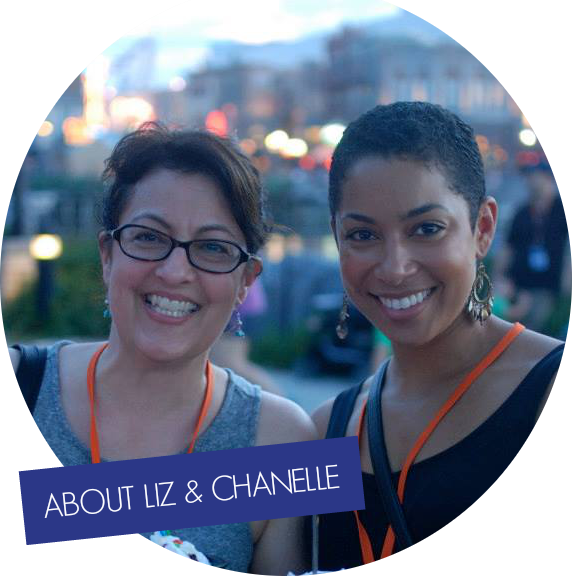 I’m also transitioning to blogging and freelancing full time. Eek! Early this summer, I’d taken up a part-time job to help me make a little extra dough so I could save up to buy a car. (Funny story…then my old car bit the dust and I was forced to buy a car sooner than expected.) But being back in an office once again, even though it was part-time, made me realize that I’m just not a nine-to-fiver. I like working from home and being on my own schedule, so I decided to give freelancing a try, and I’m happy to say that I’ve already gotten enough clients to replace that part-time job I took, and more! That’s the good part. The bad part is that I’ve been slammed with freelance work, the part-time job, blogging, and moving plans for the past month or so. But I haven’t minded it too much – staying occupied keeps me motivated. Anyway, long story short, this fall is BUSY and I’ve been wearing almost nothing but comfy clothes. A new favorite is this terry zip-up. It was perfect to have on a trip where the weather seemed to change every hour! It’s stretchy, versatile, and under $13. …and another time I wore it with these heathered blue capris with mesh hems. You can get the zip-up and the capris at Walmart stores or on their website. I’m 5’4″ and wearing a small in the zip-up and an XS in the capris. I also picked out a different pair of capris with mesh detailing, which I have worn at least three times already! Below I’m wearing them to demonstrate a mobility exercise for a new client’s website. They were perfect for this because they’re black and not distracting, but the mesh gives them a little interest. P.S. 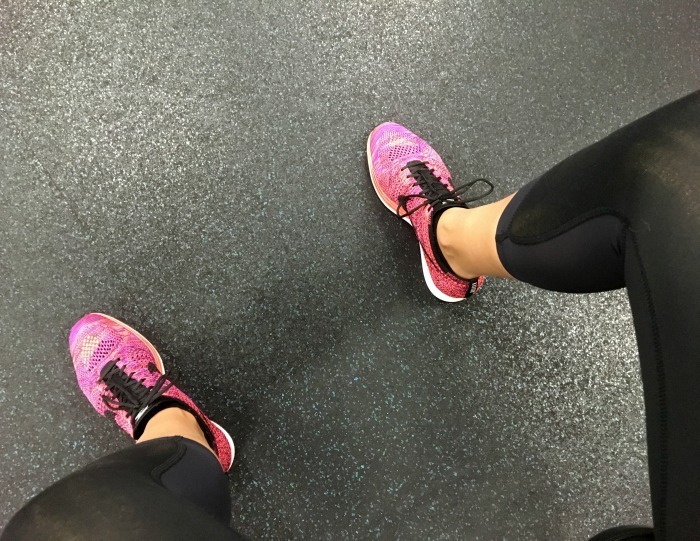 Mesh detailing on athletic clothing is extremely trendy right now, and you can’t beat $15 for trying it out! The best part about these capris is that they have a hidden drawstring. And we all know how I feel about hidden drawstrings! That same day, I wore them to the gym for a chest workout and snapped this pic between sets of bench press. Even when life gets crazy busy, going to the gym to lift and destress is one constant that keeps me sane! And keeping a stockpile of comfy clothes doesn’t hurt either. 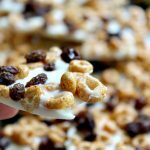 Want to try these Danskin Now pieces for yourself? Get them at Walmart or on Walmart.com. 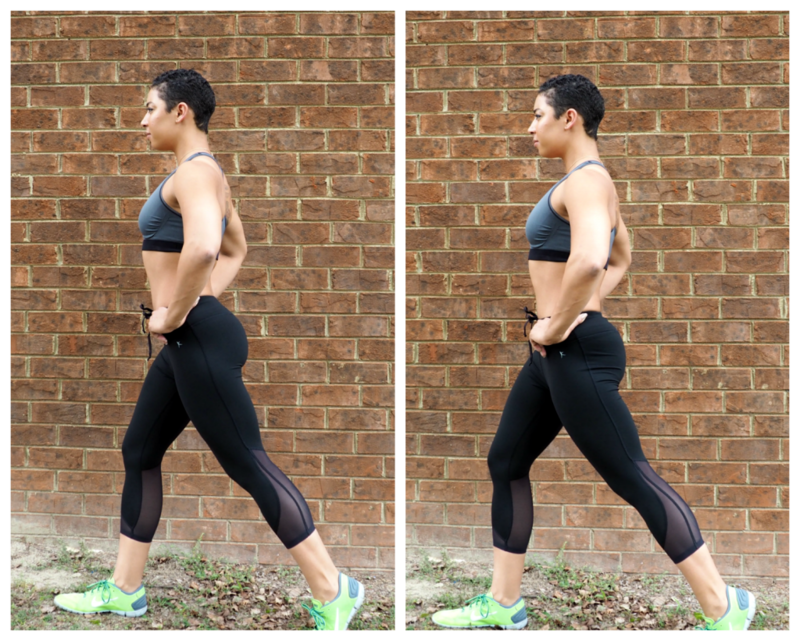 Colorblocked performance capris with mesh detail – under $14, in six colors and patterns! 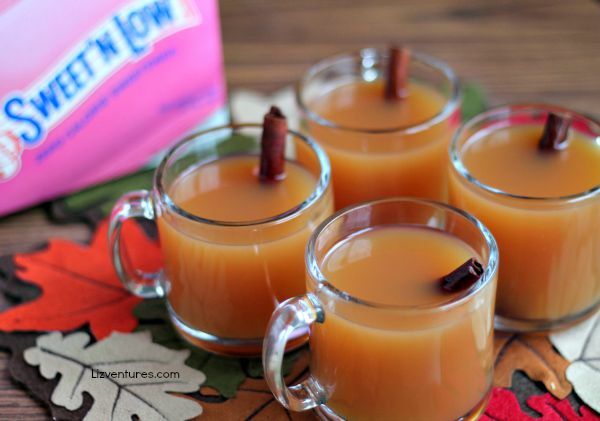 I made this Apple Pie Cider Sweet ‘N Low recipe as a sponsored post for the Socialstars #donthesitaste campaign. Opinions are my own. 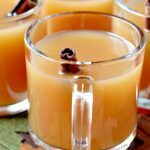 As the weather turns fall’ish and the air becomes crisper, I start to crave the comforting flavors of apple, cinnamon, maple and ginger, especially when they’re served warm. 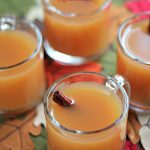 One of my favorite fall drinks is apple pie cider, and over here we love it heated up, but it’s also quite delicious when chilled. There’s also the option of serving it as a cocktail — it’s a party favorite! This year I decided to make it with zero calorie Sweet ‘N Low sweetener in an effort to reduce the calories and therefore the guilt, and I’m so happy with how it turned out. The sweetness is just right, and since Sweet ‘N Low is diabetic friendly, I know I can not only serve it at parties, but I can bring it when I go tailgating with my bestie. 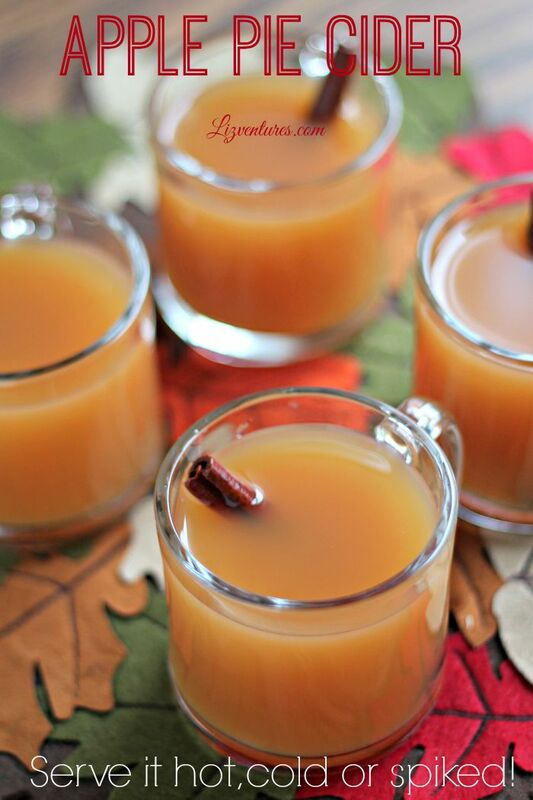 Stir together apple cider, apple juice, Sweet 'N Low, cinnamon and nutmeg in a large pot. Bring to a boil; simmer gently for 5 minutes. Remove from heat and let cool completely. 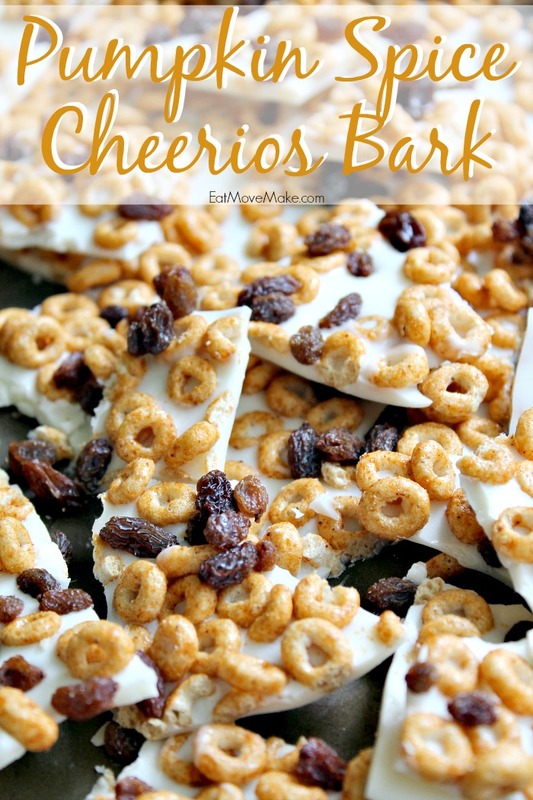 Serve with a cinnamon stick in each glass. 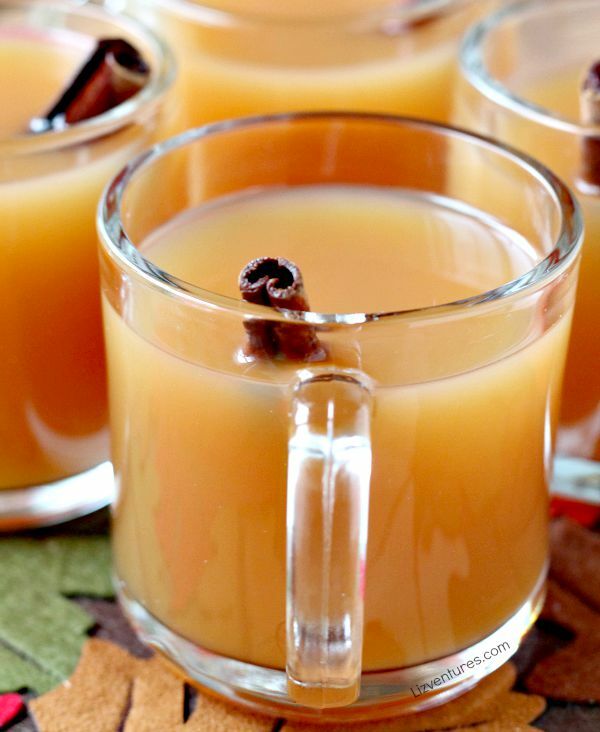 For the spiked version, add rum to the cooled cider mixture. I love seeing the coverage for Fashion Week in September every year, but there is very little if anything that’s remotely normal (or affordable) for most of us. Thank goodness the trends get watered down and translated to wearable before we see them in stores. Oddly enough, the fashion-forward (and tres bizarre) looks on the runway do inspire me to give my wardrobe a refresh. 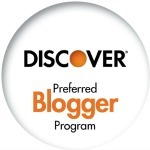 This post is part of a Discover Preferred Blogger campaign. All opinions are my own. Transitioning from warm weather to cool weather is the perfect time to add in a few pieces of clothing that can breathe some new life into the same old same old. You don’t have to spend a fortune to look fabulous either. Beat the Rush: Take advantage of early deals on fall and winter apparel. One of my favorite early Fall purchases is a great pair of boots. I wear them all the time so scoring a pair early on and for a great deal makes me happy, happy, happy! Columbia, The North Face: Earn 10% Cashback Bonus when shopping online with your Discover card at these outdoor apparel retailers. Simply log into Discover Deals to shop. Shoes.com, OnlineShoes.com: Earn 10% Cashback Bonus on all the shoes you need for your family! Just log into Discover Deals to shop. Macy’s, Nordstrom: Earn 5% Cashback Bonus at these department stores when shopping through Discover Deals! Stock up on essentials like coats, clothes and accessories. I can’t imagine having a credit card without Cashback Bonus rewards. It helps me save money when I’m spending money. In fact, about those boots I’ve been wanting… I think I have enough Cashback Bonus rewards right now to get a pair for free! 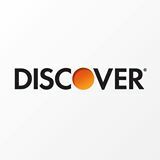 Visit Discover.com for more info and to check out the new Discover Deals portal! What Fall apparel would you love to add to your wardrobe this year?